Programming paradigm is a style of computer programming - different style approaching problems in different ways. Procedural/imperative: a series of instructions that tell computers what to do with the input to solve a given problem. Eacg instruction changes the state of the operation, for example, change the value of variables. Object Oriented(OO): objects are used to model entities in solving a problem. Functional: functions are used as the fundamental building blocks of a program. A series of functions accepting inputs are written to solve the given problem. integers as arguments and gives an integer as a result. The set of possible outputs is called co-domain. No side effects : functions can only perform some calculation and return some results- no I/O operations, no global state changes, no database interactions. In multithreads, one thread's operations will not affect others. The order of function calls will not affect the results. Referential transparency : same parameters will result in the same results regardless how many times the functions are called. Easy to write bug free, correct code due to all the reasons above. 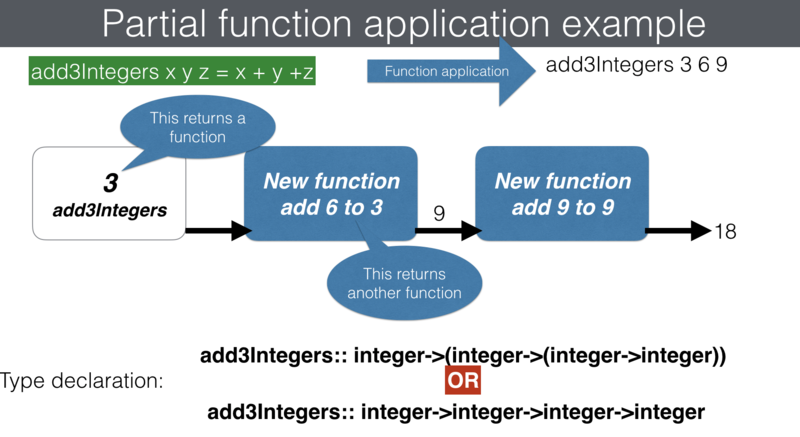 The process of giving particular inputs to a function is called function application, for example add(3,4) represents the application of the function add to integer arguments 3 and 4.
then applied to the second argument y.
the above new function also only takes on input 9. This finally produces the resulting integer. The add3Integers applies to 6 then 9, then 10 to reach the final results. Haskell functions only take one argument/input at a time. For example, integers, floating-point values, characters and strings are first class objects in many programming languages. map is a high order function that takes a function and a list and applies that function to every element in the list, producing a new list. filter is a function that takes a a function that tells whether something is true or not, and a list and then returns the list of elements that returns true when applied the function. function declaration: (a->Bool)->[a]->[a] - returns a list(the last argument) from all member of a list (the second argumen) meeting the condition set by the first argument. reduce or fold function takes a list and reduces it to a single value by applying a function recursively to the list until the list is empty: apply the function to the head and recursively apply the function to the tail of the list. The nature of recursiveness of applying function to a list is if a function can apply to the head of the list, then it should be able to apply to the rest of the list, the tail. The above function applies the function reverse to the head of the list , then recursive calls made to the tail of the list. It applies the function take to the head of the list , then recursive calls made to the tail of the list. It applies add2 function to the head of the list , then recursive calls made to the tail of the list. functional composition : Combining two functions to get a new function. For example, a function can be used as an argument in another function. The composition of g and f (g o f ) is a function.